Prominent & Leading Manufacturer from Agra, we offer zari christmas decorations, handicraft christmas decoration, embroidery christmas decoration, zari embroidery christmas hanging and zari handicraft christmas ball. Backed by the vast industry experience and knowledge, we are actively involved in offering a wide assortment of Zari Christmas Decorations in the market. 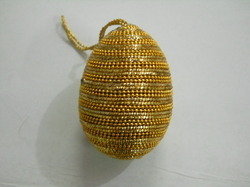 These products are designed from best quality beads that are sourced from the trusted vendors of the industry. These products are widely demanded among the clients for their unique design and light weight features. Moreover, we assured timely delivery of the offered products. We are one of the trustworthy names in the industry in presenting a wide gamut of Handicraft Christmas Decoration to our esteemed customers. To maintain the modern quality norms, the offered range of products are checked on numerous companies defined norms. Offered product can be hanged from the ceiling or a light fixture and are the best choice to decorate a ballroom and to fill the room up. 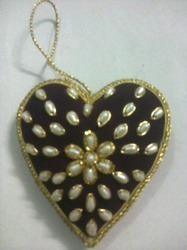 With the regular focus on the modern market trends, we bring forth a unique range of Embroidery Christmas Decoration. The offered products are designed using premium grade input factors in adherence to the defined industry standards. Apart from this, these products provide the great way to decorate homes, schools or offices. 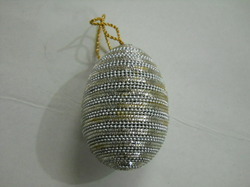 Our respected clients can avail from us a quality approved the range of Zari Embroidery Christmas Hanging. We are offering this product in various sizes option and can also be customized in order to suit the correct demand of our clients. To deliver defect free products to the clients, these are tested on various predefined quality parameters at our end. Also, this product is used for decorating purpose. 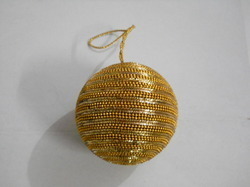 Looking for Zari Christmas Decorations ?